Since the Taliban took over Afghanistan, 11-year-old Parvana has rarely been outdoors. 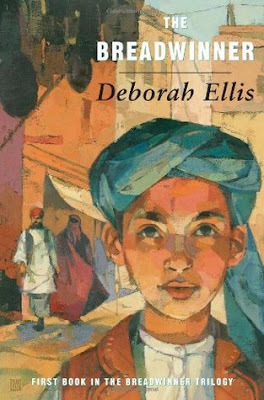 Barred from attending school, shopping at the market, or even playing in the streets of Kabul, the heroine of Deborah Ellis's engrossing children's novel The Breadwinner is trapped inside her family's one-room home. That is, until the Taliban hauls away her father and Parvana realizes that it's up to her to become the "breadwinner" and disguise herself as a boy to support her mother, two sisters, and baby brother. Likes: Parvana is a spunky eleven-year-old who is easy to love. Even though she constantly bickers with her siblings (because she’s forced to live in one room with them), she truly cares about them. When her father is arrested, Parvana is forced to find innovative ways to provide for her family. For an adult reader, this book is a quick read. It makes you grateful for everything you have. I’m happy that I don’t live in bombed-out ruins and that nobody I know has been arrested for owning books. My life is simple compared to Parvana’s. This is one of those stories that make you realize how much crap women have to put up with. Any woman who has ever lived in a Taliban-controlled area is a hero. Their laws are so restrictive that women can’t even take care of themselves. They’re not allowed to leave the house to get food or water without a man along for the trip. That’s stupid. When Parvana’s father is arrested, her mother and older sister either have to risk starvation by staying in the house, or risk arrest by leaving it. Dislikes: The second half of the book is much stronger than the first. Anyone who knows what “breadwinner” means can predict what’s going to happen. Once Parvana starts testing out different jobs, the plot becomes more unexpected. The Bottom Line: An educational, compelling story with a likeable heroine. I didn’t love it enough to continue with the series, but if you have tweens in your life, consider getting them this book. Enter the hilarious world of ten-year-old Kenny and his family, the Weird Watsons of Flint, Michigan. There's Momma, Dad, little sister Joetta, and brother Byron, who's thirteen and an "official juvenile delinquent." When Momma and Dad decide it's time for a visit to Grandma, Dad comes home with the amazing Ultra-Glide, and the Watsons set out on a trip like no other. They're heading South. They're going to Birmingham, Alabama, toward one of the darkest moments in America's history. Likes: I guess this is technically a reread because a teacher read this novel to our class when I was in elementary school. I picked the book up again because I didn’t remember much about it. I knew I liked it. I vaguely remembered the rebellious older brother, the ugly car, and the scary thing that happens at the end. The rest of the story was very foggy in my mind. Now that I’ve reread it, I can confirm that the writing and character development are excellent! Seriously, this is the most believable middlegrade book I’ve read in a long time. It’s so realistic that I’m wondering if any of it is biographical. I know that the ending is based on a real event, but I’m not sure about the rest of the story. It seems real. Even though the Watsons are “weird,” they’re not cartoonish like the characters in some other children’s books. Each member of the Watson family has a huge personality. This leads to amusing mishaps. Overall, this is a story about sibling relationships. The three Watson kids are very different from each other. Byron is angry and impulsive. Kenny is quiet and nerdy. Joetta is the baby who gets all of the attention. The kids fight a lot. Then something unexpected happens. They need to work together to get through it. Sometimes, your family members are the only ones who know how to help you. Dislikes: I remembered the funny and scary parts; I didn’t remember the plodding pace. The characters are amazing, but it takes them a very long time to do anything. 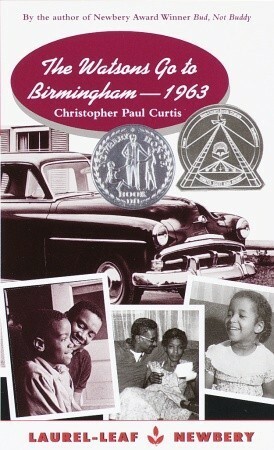 They don’t even leave for Birmingham until over halfway through the book. I wish the plot had started earlier. I feel like I spent most of the book waiting for the Watsons to go to Birmingham. It took too long for the story to deliver what the title promised. The Bottom Line: This novel fully deserves its “modern classic” label. It has some of the most realistic characters I’ve come across in a kids’ book. Yeah, I’m really happy to live where I do. This are both new to me, so I'll be sure to check them out! I'm not sure if the second one would work for me, because I don't normally grab historical fiction, but my interest is piqued. If you read either of them, I hope you like them. 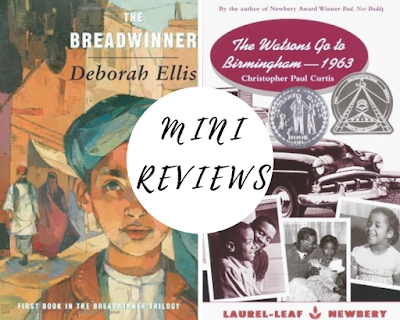 Two very incredible socially conscious books. "The Breadwinner" sounds like a younger "The Kite Runner"
I own The Kite Runner, but I haven’t read it yet. It’s on my priority list for this year. These are some great picks and ideas for my middle grader. He loved I Am Malala so I'm tempted to pick up this first one for him! Yes! If he liked I Am Malala, he’d probably like The Breadwinner. Somehow The Watson Go to Birmingham escaped my attention. Then again, I was long out of school when in came out in 1995. I like the sound out it even despite the slower pace. It’s really well-written. I didn’t notice that when I heard the story as a kid. These are both new to me but sound like worthy reads. I do want to read more middle-grade books. Great reviews! Thanks! Whenever I read middlegrade, I wonder why I don’t read more of it. There are some really good MG books out there. I saw the Breadwinner film and it was just incredible. I really have to read the original source material. Thanks for the review! I want to see the film. I’ve heard that it’s beautiful.